San Jose Diridon Ballpark – While the City is speeding up land acquisition, what about Autumn Parkway and other mitigations? Will the funds be in place for the rest of the project, or will it get kicked down the road? Oakland Victory Court Ballpark – Oakland already had to deal with a tight schedule based on a 2015 Opening Day. Now, Oakland will have to get its bonds raised and land in place right around the time an EIR is certified, or even before certification. Expect for Oakland to push MLB harder to decide in its favor, even without anything significant in place. 49ers Stadium in Santa Clara – The quasi-public stadium authority would have to get its loans and/or bonds in place in the next 18 months as well. New Raiders Stadium at the Coliseum – A new stadium is practically a nonstarter given the funding questions. Expect the Raiders to look south sooner rather than later. Downtown Los Angeles NFL Stadium – The now $1.5 Billion stadium (+$500 million in the last two weeks) would require $350 million in bonds, which won’t be available if RDA’s go away. City of Industry NFL Stadium – Ed Roski’s plan involves his own land, but much of the stadium cost would be funded by tax increment on the land improvements, thanks to much of the city being one large redevelopment zone. Uncertainty regarding RDAs makes the prospects for building infrastructure for the stadium and ancillary development, murky at best. Sacramento Kings Arena – As Kevin Johnson’s arena task force continues to talk things out, time is running out, especially for an arena at the long dormant Railyards. San Francisco Arena – Land south of AT&T Park could serve as the site for a new arena. Controlled by the Port and with development rights given to the Giants, it’s likely that any dev plan there will require at least the same kind of public outlay that made the ballpark deal work. Proponents would have to find another source for that funding. This entry was posted in Baseball, Basketball, Coliseum, Feature, Football, Oakland, Politics, San Jose. Bookmark the permalink. The consequences and implications are far reaching but this will be a tough sell to an inept congress. I don’t see it happening but who knows, maybe the legislature will surprise. Don’t want to get too political… but, the banks “win” again (higher student fees = larger loans!). Glad to see K-12 education, shown some mercy. The Raiders are not going to LA. Al Davis is old. Its easier to drive down from Piedmont to the Coliseum, than fly to LA. @David – Was referring to “south” as Santa Clara, not LA. @ML – I did not see official verbiage citing that Brown was going to get rid of the RDAs, only speculation at this point. This goes against his new policy of making local governments more responsible for their well being. Maybe the RDAs are still in place, but controlled directly by the legislature and governor since Brown looks like he’s cutting out the fat in the command hierarchy. @ST – Brown made it abundantly clear that he wants going to choke off RDAs in terms of being a development funding loophole. If localities want to embark on projects, they’re welcome to do so – as long as they fund it themselves (taxes). There are instruments such as Mello-Roos that can allow for new projects, new infrastructure. Beyond that, things have to be done the old-fashioned way: pay-as-you-go. Brown mentioned an “alternative mechanism” for economic development compared to RDA’s, but didn’t get into the much detail. His aide talked a lot about how RDA funding would be cut. 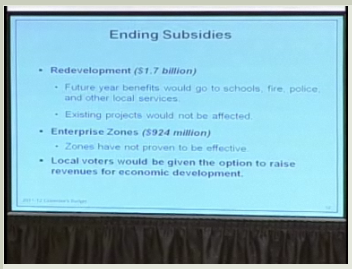 I added a screencap of the relevant slide from Brown’s preso into the main post. Judge for yourself. If he gets his way, Brown will force the stadium issue. Maybe we’ll be hearing from the BRC sooner rather than later since it’s far more likely for San Jose to get the stadium built in this timeframe. More on the “alternative mechanism” – at some point there will be some legislation to allow what would be considered public projects to be approved on the local level with a 55% majority, the same threshold set for school bonds. Not the complete death of RDA, but it would be exceedingly difficult for RDAs to operate with the same kind of latitude they do currently. @ML – Thanks for the clarification. I’m just surprised i haven’t read more about it especially from the Merc or LA Times, since those are the 2 largest RDAs. Quick question: I’m still trying to get my mind around how Brown’s proposal would reduce state spending. It would take the money normally given to RDAs and give it to counties, cities and schools. So it seems like it would give local government more control of the money but where is the savings? My pea sized brain can’t figure it out. @Roscoe – Reclaiming RDA won’t reduce spending. It will help bridge the budget deficit. The proposal is nearly 200 pages long and most of it covers cuts, not new revenues. Thanks Marine Layer. I see my understanding of it was wrong.